Eastern Time, hitting the southern coast of New Jersey, with its winds slowing slightly to 80 miles an hour from 90 miles an hour earlier, the National Hurricane Center said. By Monday evening, the super storm had already knocked out power to more than 2 million homes and businesses from North Carolina to New England. And a jogger rounding a corner, or cresting a hill, might suddenly come face to face with the true extent of the damage that Monday night’s historic storm had inflicted: cars displaced by the 13ft storm surge that sluiced through Manhattan’s financial district; dangerously damaged power cables; trees wrenched from the ground by the wind; a 700-tonne tanker run aground on the Staten Island shoreline. A state of emergency was declared for Connecticut, Delaware, Washington, D.C., Maryland, Massachusetts, New Jersey, New York, Pennsylvania, Rhode Island and Virginia. 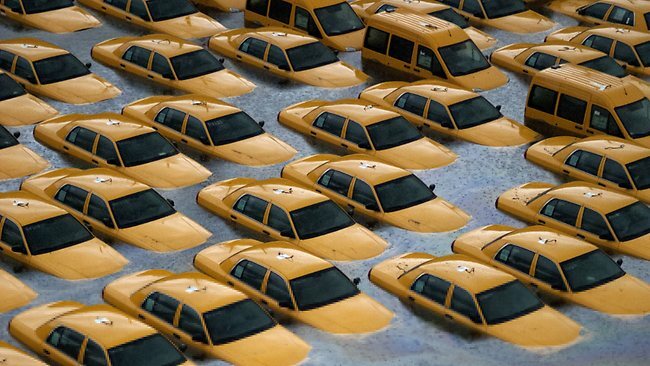 Even before Sandy made landfall, streets in New York, Maryland and New Jersey were already under water, as winds and water pushed ahead of the hurricane. Swelling water overran barriers in Atlantic City, N.J., where the Boardwalk was reported damaged from the hurricane-force winds that stretched up to 175 miles from the storm’s center. Snow was forecast in several states, with blizzard warnings out for higher elevations in Maryland, West Virginia and Virginia. President Barack Obama canceled campaign events to return to Washington, D.C. to oversee the federal government’s response to Sandy. Obama warned the storm, which killed at least 65 people in the Caribbean, could impact millions across a large piece of the United States. “Do not underestimate this storm, we are talking about surges we have not seen before,” New York Gov. Andrew Cuomo said of anticipated record flooding in low-lying coastal areas. 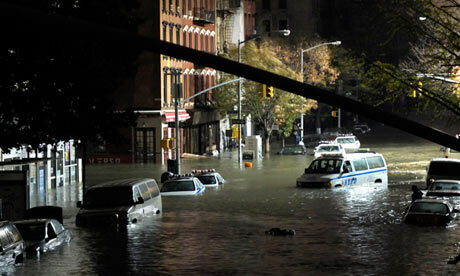 By mid-morning, the clean-up from Hurricane Sandy – reclassified, late on Monday, as a “superstorm” – was well under way. In Central Park in Manhattan and Prospect Park in Brooklyn, work crews were busy clearing tree limbs; on the Upper West Side, doormen hosed leaves into the gutters; at Ground Zero, a still-gaping hole into which river water gushed on Monday night, the repairs were beginning; John F Kennedy airport was scheduled to reopen on Wednesday. But at the same time, New Yorkers were still struggling to calculate the true scale of the storm’s impact. 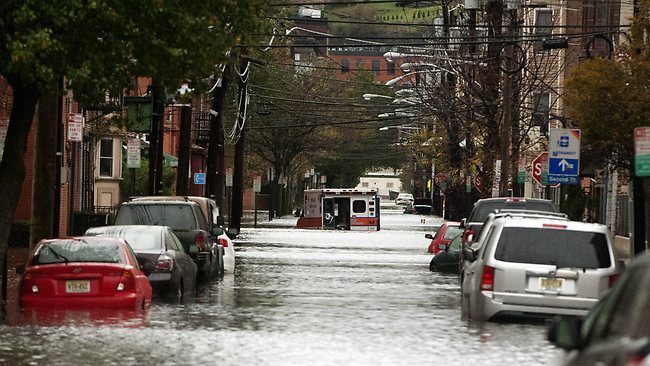 Towns in New Jersey and Long Island remained under deep water, while flooding had significantly damaged homes and businesses across New York. The city’s schools were due to stay closed on Wednesday. The New York Stock Exchange remained closed on Tuesday, the first time since 1888 that it had closed for two days running because of the weather. There is no light in the street, no people in the street,” said Ilona, a 22-year-old student from Russia, as she looked out over the murky water. From time to time an acrid smell of burning drifted by, as short circuits in the electrical grid sparked distant fires. On either side of the island of Manhattan, West Street and the FDR East River Drive were quickly underwater. It had recently been renovated, the New York Times reported, after being damaged in 2011 by Hurricane Irene. The night’s most dramatic rescue story concerned the evacuation of about 200 patients from New York University’s Langone Medical Center, after the hospital’s backup generators failed. Throughout the night, most people seemed to agree, the region’s most senior politicians – New York mayor Michael Bloomberg, New Jersey’s fleece-clad governor, Chris Christie, and Governor Cuomo – were successful in their efforts to maintain calm and provide essential information. Was the New York Stock Exchange under three feet of water, as CNN, apparently working from internet rumours, reported? Was a hospital on fire in Coney Island, and were a score of power-company workers trapped in a building in Manhattan? New York, Philadelphia, Washington and Baltimore moved to shut down their subways, buses and trains and said schools would be closed on Monday. As rain from the leading edges of the monster hurricane began to fall over the Northeast, hundreds of thousands of people from Maryland to Connecticut were ordered to evacuate low-lying coastal areas, including 375,000 in lower Manhattan and other parts of New York City, 50,000 in Delaware and 30,000 in Atlantic City, N.J., where the city’s 12 casinos were forced to shut down for only the fourth time ever. If it’s not the storm, it’ll be the aftermath. Authorities warned that the nation’s biggest city could get hit with a surge of seawater that could swamp parts of lower Manhattan, flood subway tunnels and cripple the network of electrical and communications lines that are vital to the nation’s financial center. As of 8 p.m., it was centered about 485 miles southeast of New York City, moving at 15 mph, with hurricane-force winds extending an incredible 175 miles from its center. The storm could also dump up to 2 feet of snow in Kentucky, North Carolina and West Virginia. 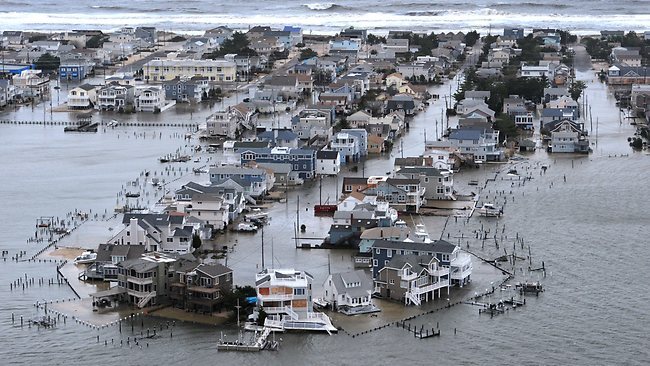 Louis Uccellini, environmental prediction chief for the National Oceanic and Atmospheric Administration, told The Associated Press that given Sandy’s east-to-west track into New Jersey, the worst of the storm surge could be just to the north, in New York City, on Long Island and in northern New Jersey. New York called off school Monday for the city’s 1.1 million students and announced it would suspend all train, bus and subway service Sunday night. The New York Stock Exchange announced it will shut down its trading floor Monday but continue to trade electronically. In Washington, President Barack Obama promised the government would “respond big and respond fast” after the storm hits.